Shelf Life: approx 4 yrs stored in a cool dark place. 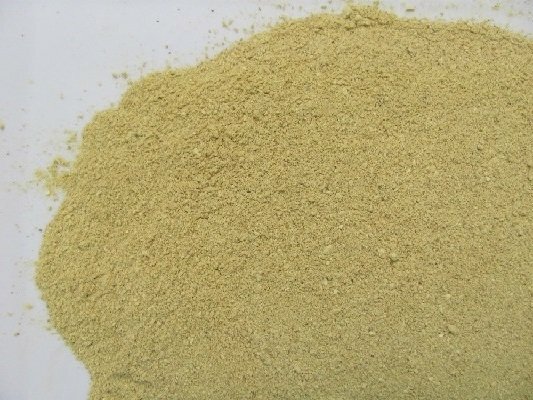 Our Premium Lion's Mane Mushroom is fine ground, suitable for making capsules. One 8 oz. bag will make approximately 400 capsules, size "00"
Lion's Mane is used to aid in digestion; stimulate the nerve growth factor (NGF) in the central and peripheral nervous system; repair neurological degradation from senility; improve cognitive function and memory loss; and to improve reflexes. Known Powder Dosage (for Adults): Add 1/4 teaspoon to soups, salads, or stir into coffee and smoothies 2 x a day. Or, use the powder to make "00" size capsules. Tips for Capsule Making: 1/4 tsp is equivalent to 2 capsules, size "00". An 8 oz. bag will make approximately 400 capsules. Neuron Regrowth - To stimulate nerve cell growth, take 2 capsules, twice a day (2 capsules equals approx 1,100 mg) continuously, long term. Lyme Disease - You can find information about Stephen Buhner’s protocol for the use of Lion's Mane in the treatment of Lyme Disease at http://buhnerhealinglyme.com. There is much to know about how Lion's Mane is used for targeting spirochaete bacteria in the brain, caused by Lyme Disease. Lion's Mane can pass through the blood brain barrier, unlike Teasel, thus releasing spirochaetes into the blood stream to eradicate the bacteria. This calls up a bulk of work for the immune system, therefore, it is recommended that a regiment for immune system support be implemented as part of an overall treatment plan. Generally, Lion's Mane is a food source and considered safe. However, if you are allergic to mushrooms or derivatives of fungi, do not ingest this mushroom product. Do not take Lion's Mane if you are pregnant or nursing unless you have consulted with a healthcare professional. If you are using Lions Mane for the treatment of Lyme Disease, what is known as the Herx Reaction may cause a notable amount of discomfort from the spirochaete bacteria release. A study on rats in 2005 showed that some compounds in the mushroom, like threitol, D-arabinitol, and palmitic acid may have antioxidant effects, may regulate blood lipid levels and reduce blood glucose levels. Ying (1987) reports that pills of this mushroom are used in the treatment of gastric and esophageal carcinoma. Scientists have investigated this mushroom for possible anti-dementia compounds. Primary research has demonstrated that it stimulated animal nerve cells, stimulated nerve growth factor in an in vitro experiment with human astrocytoma cells and stimulated myelination in another study. A double-blind, parallel-group, placebo-controlled trial showed improved cognitive ability. Int J Med Mushrooms. 2013;15(6):539-54. Neurotrophic properties of the Lion's mane medicinal mushroom, Hericium erinaceus (Higher Basidiomycetes) from Malaysia. Lai PL1, Naidu M, Sabaratnam V, Wong KH, David RP, Kuppusamy UR, Abdullah N, Malek SN. Int J Med Mushrooms. 2012;14(5):427-46. Neuroregenerative potential of lion's mane mushroom, Hericium erinaceus (Bull. : Fr.) Pers. (higher Basidiomycetes), in the treatment of peripheral nerve injury (review). Wong KH1, Naidu M, David RP, Bakar R, Sabaratnam V.
Chin J Integr Med. 2016 Oct;22(10):759-67. doi: 10.1007/s11655-014-1624-2. Epub 2014 Aug 26. Hericium erinaceus (Bull. : Fr.) Pers., a medicinal mushroom, activates peripheral nerve regeneration. Wong KH1,2, Kanagasabapathy G3, Naidu M4,3, David P4,3, Sabaratnam V3,5.